Allegra Boverman/Gloucester Daily Times. 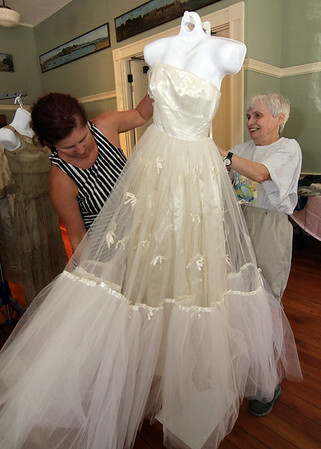 Sarah Clark, right, and Renata Fryshara, of the Sandy Bay Historical Society, arrange the hand-sewn prom dress of Janet Peterson, dating to 1962, at Community House in Rockport. “In Style: Two Centuries of Cape Ann Fashion” , vintage clothes from the collection of the Sandy Bay Historical Society, will be on exhibit at the Rockport Community House, Broadway, Friday August 16 through Sunday, August 18, from 10 to 4 p.m. There are also exhibits at the museum itself and at the Rockport Public Library with some of the outfits, too.